Mid Autumn Festival is around the corner. In conjunction to this festive season, 8TV hosts and local celebrities will be having an “8TV Carnival” at Berjaya Times Square from 10am-10pm on 14th September 2013 (Saturday). 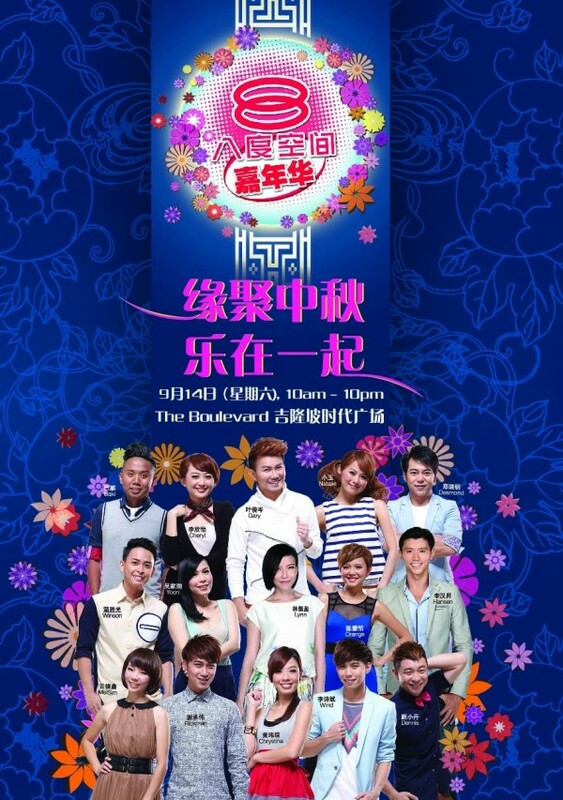 During the carnival, the fans can get the chance to meet hosts from ：《好吃！》、《八八六十事》、《时代达人》、《夏娃记事本》、《启航》、《夺宝先锋》、《女王100FUN》、《横行8道》. 8tv hosts including Gary 叶俊岑、Natalie小玉、Yoon吴家润、Chrystina 黄玮瑄、Lynn林佩盈、Baki巴麒、Cheryl 李欣怡、Desmond 郑瑞钥、Orange陈慧恬、Rickman 谢承伟、Mei Sim 云镁鑫、Winson 温胜光、Hansen李汉昇、Dennis颜小丹以及Wind 李诗斌 will be at the event venue to interact and play games with the fans. Prizes will be given away too during the event! Worth Mentioning is, 8tv Carnival this time will be featuring a Stage Performance with a theme of China Ancient Tales which allows the fans to “travel” back to the ancient times! Besides, there will also be a Lantern Parade which will provide the audience a Mid-autumn festival feel! Besides, there will be a 『八度空间嘉年华音乐会』Music Show at 7pm which features artists such as dayDream、李欣怡、温胜光、《非常好声》finalists Catherine梁佩颖、Windy陈姳妤& Sylvia黄薛栗 and《非常好歌》3甲演绎人郭修彧、邝暄恒&符俊贤!